A mystical flying serpent; The Cuelebre. The Cuelebre is a mystical flying serpent-dragon from the Austurias and Cantabrian regions of Spain. Like dragons, the Cuelebre dwells in caves and hoards treasure. It also keeps a women prisoner, in this case, the Xanas, which are mystical nymphs of extraordinary beauty. 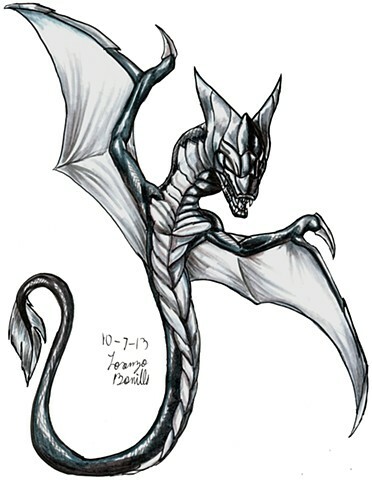 Though immortal, the cuelebre grows old over time with their scales hardening and growing bat-like wings. They hardly move, save when they are hungry. It is said that their spit hardens into a mystical stone capable of healing many illnesses. At certain points in the year, the Cuelebre's power waxes and wanes. At Midsummer, is when the Cuelebre is at its weakest, while at the night of St. Bartholomew, it is at its strongest. Should the Cuelebre reach a certain age and their scales reach a certain thickness, the Cuelebre retreats to a mystical paradise beyond the sea called Mar Cuajada. My drawing of the Cuelebre is sticking with the classic version while emphasizing the thickness of its scales using shading. Not much else to it, save for making the head crested to further accentuate the scale detail and and making the wings more dragon than bat, which is what most dragon wings are really.